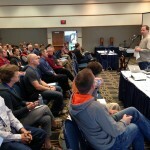 Tom Avey welcomes pastors to the Central Focus Retreat. 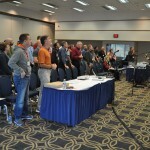 Pastors worship at the Central Focus Retreat. 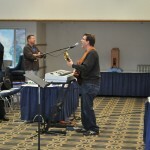 Bob Vanderliet, worship pastor at Grace Church, a Grace Brethren congregation in Powell, Ohio (Rick Nuzum, pastor), is leading worship. Dr. Dave Guiles is leading the Focus Retreat. 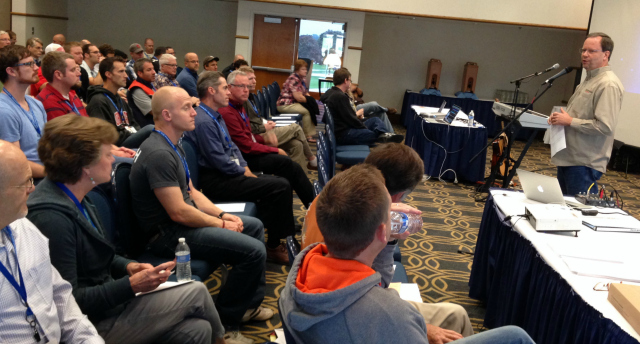 More than 80 pastors and leaders from Grace Brethren churches and ministries from Ohio, Indiana, Pennsylvania, Illinois, and Michigan, are gathered this week at Maumee Bay State Park near Toledo, Ohio, for the Central Focus Retreat. 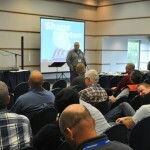 Led by Dr. Dave Guiles, the 48-hour retreat is focusing on “Shaping the Future” and is designed to begin conversation about the Charis Commitment to Common Identity, a summary document of the biblical convictions, mutual commitment, and common practices for the Grace Brethren movement in North America. The first session this afternoon is focusing on “A Great Cloud of Witnesses: Understanding the DNA of the FGBC” and “Why This, Why Now?” of the Identity Initiative. This evening will conclude with a three-fold communion service. The retreat continues through Wednesday morning.